Fast-food menus are among the most rigorously tested products of our consumer culture. Because the decision of what to order for lunch isn't that important in the grand scheme of things, we don't spend much time or thought on it. Instead, we rely on cues in the environment. If your friend mentioned having a barbecue sandwich yesterday, you're more likely to try it today (assuming you like barbecue, and the friend). Memories are short, so the most powerful source of cues is the menu. The prices are designed to get consumers to order more than they might have otherwise. • The most common trick of fast-food menus is the "combo meal." As everyone understands, the combo meal offers an incentive to order something extra. The burger plus fries plus soda combination costs just pennies more than burger plus soda à la carte. You might as well get the fries — it seems like you're throwing away money not to order it. For most consumers, this is irresistible. There's another reason fast-food places offer combo meals. They foster confusion. It’s hard to be sure how much the burger costs, and how much the drink costs—and whether it’s too much. So consumers are a bit less price-sensitive with combos. Of course, eventually repeat customers become familiar with the prices of their favorite combos. 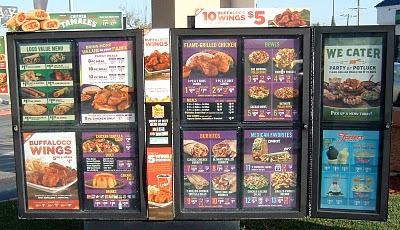 For this reason, fast-food menus are an ever-changing caloric kaleidoscope. New entrees are offered, and old ones change or vanish. Combos can be super-sized. Do you want curly fries? You can’t buy exactly the same thing you did last time (neither can you compare prices, exactly). 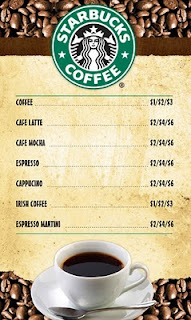 • The Starbucks menu uses the "rule of three." The menu offers three sizes of coffees, given the enigmatic names of Tall, Grande, and Venti. (They're 12, 16, and 20 ounces respectively; 24 ounces for cold Venti drinks, to allow for ice.) Since Starbucks newbies won't know what they're getting, they tend to order the middle choice, Grande. In the psychology literature, this is known as "extremeness aversion" — people instinctively favor a middle choice, figuring it's safer. Guess what? You've just ordered two cups of expensive coffee. The Grande's sixteen ounces is two regular cups. Here's a secret: Most Starbucks will serve you eight ounces of coffee, but you have to ask for a "Short" coffee (which isn't listed on the menu). You have to remember that password "Short": Company policy says that a customer who asks for a "small" coffee is to be given a "Tall" one. • Anyone who doubts the power of prices ending in 9 should check out a fast-food menu. The menu above, at a Los Angeles Pollo Loco outlet, has 75 prices, and all but one end in the digit "9." • The exception: a deal offering 10 buffalo wings for $5. Quick: How much is that per wing? It takes most of us a moment to do the math. And that's the point: not many people bother, not with kids screaming in the back seat. But "10 wings for $5" sounds like a better deal than "50 cents a wing." Poundstone, William. "Menu Mind Games." New York, December 14, 2009. Poundstone, William. "Menu Psych." YouTube, 2009. Great video. You touch on some good marketing points--amazing how much thought goes into a menu. nice blog for all candidates..
PEC has announced to declare the BISE Gujranwala Board 5th Class PEC Result 2018 on 31st March 2018 for all the registered students. The students are very keen to view their results.We will display the result and all the candidates can get their result online right from here.